Note: This was first published on Portland Travel Tips in 2014. I am importing miles and points related posts from there and re-posting here. After spending two days in Bruges it was time to head to Brussels for a day. We arrived in Brussels around lunch time, dropped our bags off at the hotel, had a quick bite (while walking to Grand Place), and started exploring the city. The first stop on any tour of Brussels, must begin at the Grand Place. One of Europe’s iconic public squares. After hanging out in the Grand Place, people watching and having a beer, it was on to the Manneken Pis. This little guy is tucked away by some shops and restaurants a few blocks from the Grand Place. He was dressed up as a Red Devil because the Belgium national team was playing in the World Cup. Brussels is split between upper town and lower town. The upper town is about 200 feet higher in elevation and as you can imagine that’s where the aristocrats settled back in the day. Upper Town is home to the Royal Palace, Palace of Justice, Place Royale, and a handful of museums. The Royal Palace used to be home to the king and queen, but is now mostly an office building for the royal family. The Place Royale is a square near the Royal Palace. The dude on the horse in the middle of the square is Godfrey de Bouillon, who led the first crusade. The statue of Godfrey is facing this view. A park and the spire of City Hall off in the distance. We continued walking around upper town and stumbled into a farmer’s market, with a guy selling something that I have always wanted to try. Jamon. By way of a little background. Spain is on my to do list. Aside from spending time in the Madrid airport I have not been to Spain. I also love to eat pork. Jamon is cured pig’s leg from Spain. It looked amazing and after getting a taste from the vendor I had to buy a few slices. Being the cheapskate that I am, I was hesitant but I had to get it. Six slices put me back 18 euro ($25). We got some cheese to go with it and it made a nice picnic lunch. I don’t even know how to describe the taste, it was almost buttery in flavor. It was fantastic. Spain just went higher on my to do list. After dinner that night, mussels of course, we went to King Baudoin Stadium to watch Belgium play South Korea in the World Cup. The crowd was lively and fun to watch. The next day we were off to Paris for 4 days. I can’t believe how much sight seeing we jammed into 4 days. A piece of advice for anyone visiting Paris. Get the museum pass. It covers almost every major sight and lets you skip the ticket buying lines. Very handy for places like the Louvre and Versailles. One our first day we hit up Notre Dame, Sainte Chapelle Church, Paris Archaeological Crypt, and the Louvre. I love this side view. 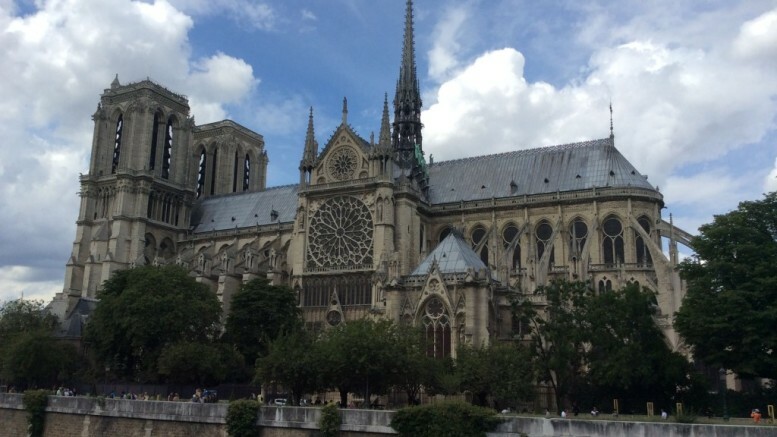 Notre Dame’s architecture is stunning. A nearby church with less stunning exterior architecture is Sainte Chapelle, but inside is a chapel filled with stain glass. After touring Notre Dame, Sainte Chapelle and other sites on Ile de la Cite it was off to the Louvre. I heard that the museum is less crowded in the evenings so we went to the museum around 5:00. There was not much of a line to get in but it was still crowded. I can’t imagine what the place is like during peak hours. I really like Greek and Roman art. This is a greek original Venus de Milo, it’s only 2000 years old. We of course, also saw the Mona Lisa. Let me say this about the Mona Lisa. While it is a great piece of art, the crowds are ridiculous. I think most are there just to say they’ve seen it, take a picture and move on. I spent a good amount of time just sitting back and watching the crowd. Our second day was spent out at Versailles. Versailles was built by King Louis XIV who fancied himself as a new age Roman Emperor. Words cannot really describe how grandiose the palace and its grounds are. Seeing Versailles first hand certainly puts the French Revolution in perspective. The next day we visited the Arc de Triomphe, Orsay Museum, and the Rodin Museum. The Orsay museum is a converted train station, that I think is a really great museum. It shows the transition from classical art of the late 18th century to realism and impressionism. Sorry I don’t have pictures of the art, picture taking was not allowed. Next stop was the Rodin Museum, perhaps the greatest sculptor since Michelangelo. Once we were finished touring the museums we had dinner and then walked back to our hotel. Walking made us a little hungry so we stopped at a crepe stand for a sugar and butter crepe. On our last full day we climbed the Eiffel Tower, toured Napoleon’s Tomb, and souvenir shopped. At 7 days and 8 nights, this was a very short trip. I would have preferred doing this over 10 or 12 days, but you make due with what you got. We crammed in a lot of sightseeing, ate some wonderful food, and had a great time doing it. I look forward to returning. 3 Comments on "A Mostly Pictures Trip Report: Part II Brussels and Paris"
First of all, great pics. I bet it was a great trip. Been to the Netherlands but never to Paris nor Belgium. But just wanted to drop a line here about the ham. I live in Portland but I’m from Spain. If you liked that jamon, what I’m sure it was good quality (had to be at that price! ), you’ll love it there. It’s just one of the many amazing meals you can have there. I love Portland because of the beer (what I miss a lot when I visit spain) but I do miss the food a lot. If you go there, please go to the north. Avoid the stereotype of the South, bullfighting, flamenco and all that. You won’t regret it. I’m glad you liked the photos. If you like beer visiting Belgium is a must. I’m really looking forward to visiting Spain one day. Thanks for the tip about the north. Hello, Cool stuff. I am looking forward to see a lot more of your work.